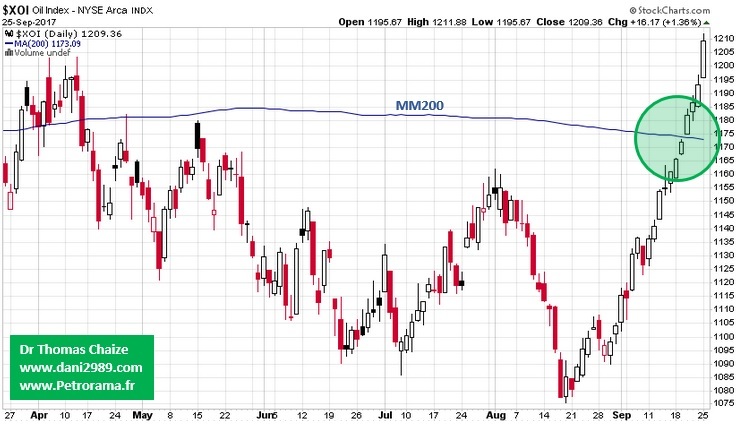 For technical analysis, the best long-term indicator is the 200-day moving average. When the price goes below it is bearish, when it passes above it is bullish (long term). 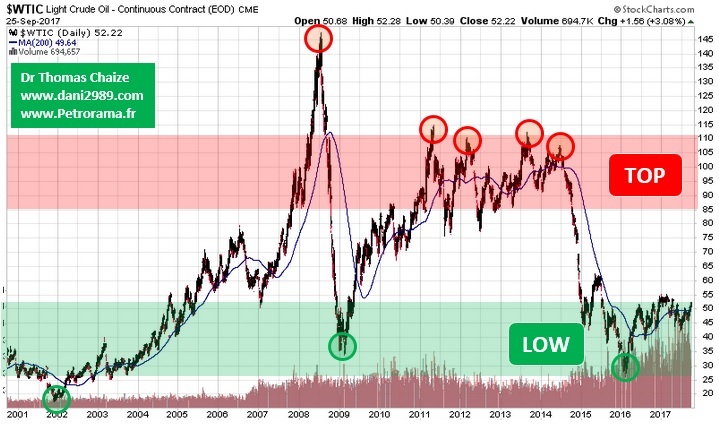 One must always look at the long-term trend of a sector before studying a company with a magnifying glass. 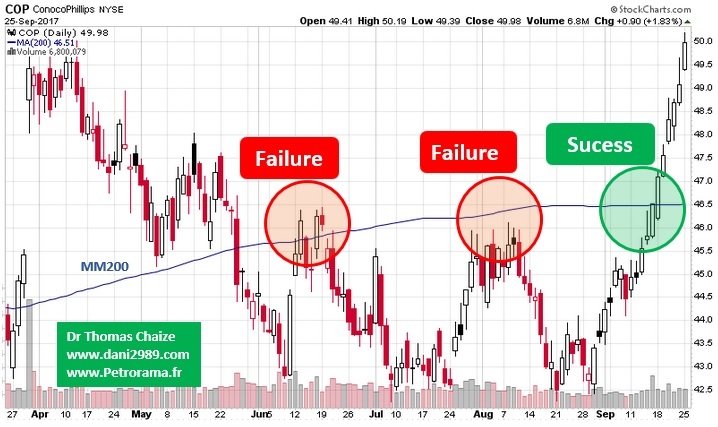 If the sector is in bearish phase, even the best company in the world will have difficulties. I. The price of oil in the short term (6-month chart). After two failures on the 200-day moving average, the WTI (West Texas Intermediate) barrel price has passed its 200-day moving average. II. Long-term oil prices (16-year chart). I will not talk to you today about the peak of production (too long). But just a simple observation: low cycle for 2 years. For a complete overview here is the XOI index in New York (Arca Oil & Gas Index). He also rose above his 200-day moving average with a very nice series of white candles. 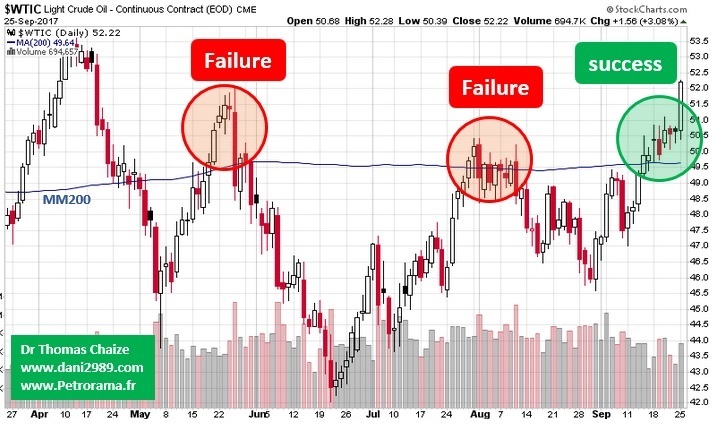 To finish here is the graph of an oil company: Conoco (this is not a buying or selling advice). Same bullish trajectory as for the XOI index of which it is a part. Attention in practice there are very important variations between the oil companies according to their size and their activity. In a trough of the cycle when the whole of a sector passes over its MM200 it leaves room for a little "enthusiasm". The roadmap, in the long term, is binary: above the MM200 we click on "ON", below on "OFF".